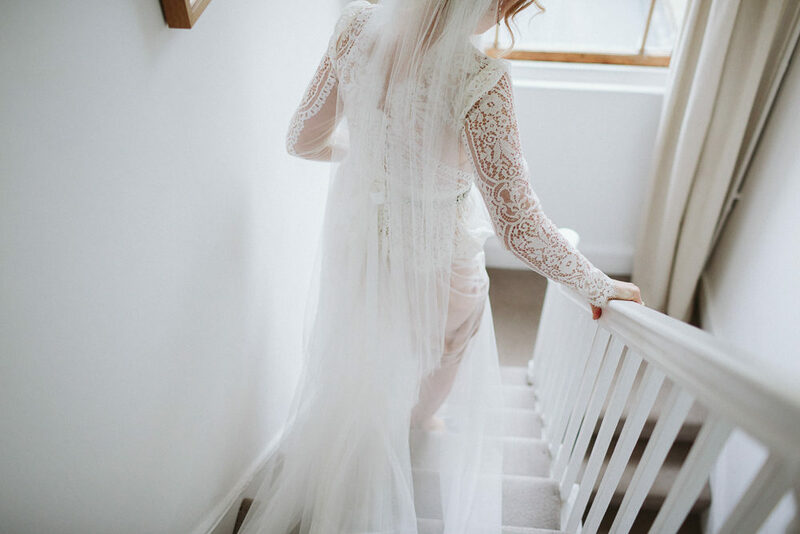 I’ve loved this wedding dress from Katya Katya Shehurina ever since I clapped eyes on it’s delicate-lace-pink-underlay loveliness and so it’s SUCH a pleasure to finally blog a real wedding with the Bride wearing it!!! And doesn’t Carly wear it well? 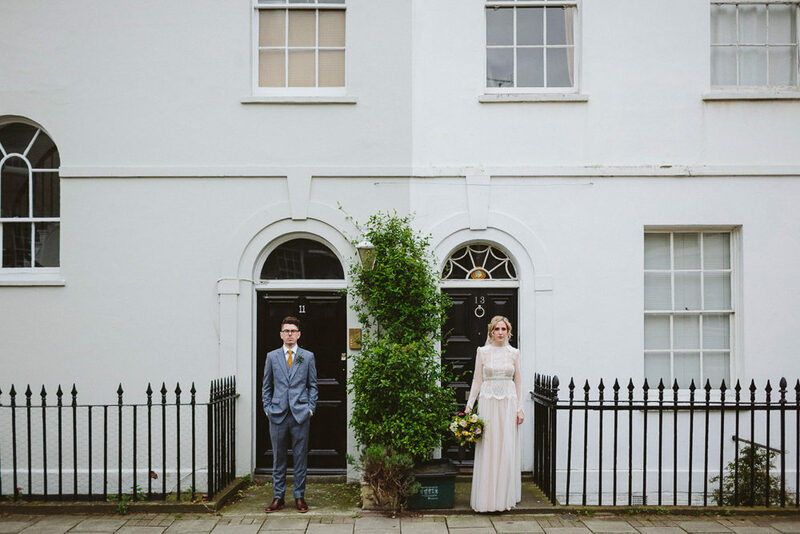 Carly The Bride: I found my dress at the Excel Wedding Fair. It was the second dress I tried on and loved it instantly. I found Katya via a blog they were so good at knowing what would suit me. I had only visited them for ideas and put my deposit down a year and a half in advance! My nanny who passed away had asked my mum to pay for my dress when the moment arrived so it was all the more special. I really struggled to find something to suit me veil wise. I wanted the floral crown but it just looked silly on me! Whilst shopping for my mum’s outfit we were at Dreams in Norwich during a visit home and the assistant there really got my boho romantic look I was going for and found a stunning veil with a vintage style pins, which attaches via a comb into the hair quite low and drapes down over the scalloped back of my dress. I kept my jewellery really simple. My nanny’s eternity ring and some art deco inspire long tear drop earrings from Etsy. Victoria rescued me from a nightmare hair trial! I had a guy come to the house who really didn’t listen to my brief, completed his own version of my pintrest ideas and then remained pretty inflexible when I tried to tweak it and suggest what I needed more. 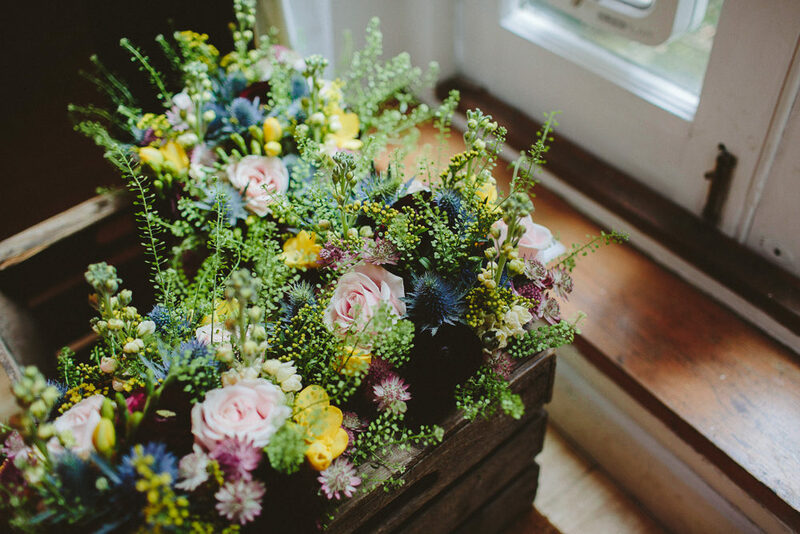 My tip for brides – don’t be afraid to say ‘that’s not what I wanted’. Also know when you are working with someone that’s not going to be an asset to you on the day itself. Victoria was so ready to take on the challenge, she calmed me down, explained what my hair could and couldn’t do, and was up front in suggesting possible solutions – ie hair extensions (hallelujah! ), and together we got there. The loose curled boho side up-style was perfectly constructed, and was exactly what I had imagined/briefed her on. 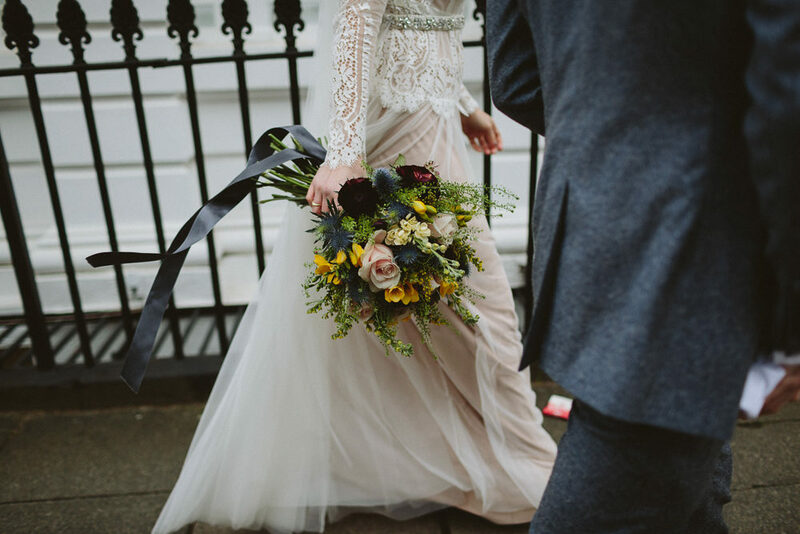 On the day she finished the look with baby’s breath and rosemary from the flowers – I couldn’t have been happier. She did a fab job making all my bridesmaids feel great with an array of romantic vintage styles – even mum got a stunning up do! I was very lucky to have a friend who’s building up her wedding portfolio offer to do my make up for the day. Anna was great, during the day we played around with a few different looks and levels of makeup application. My brief was loose, romantic, but not too girly – and she did an outstanding job. Anna’s niche is eyes – she also did the make up for the bridesmaids and mum, and they all commented on how much they loved the eye makeup. I looked like myself, but a better version which is exactly what you want on the day. Sam really wanted a mod style fitted slim style suit. Beggars Run were the only ones that could deliver what he was looking for and the fitting meant it looked so sharp on the day. Ties were from Swagger and Swoon. You don’t know how hard it is to find mustard ties! 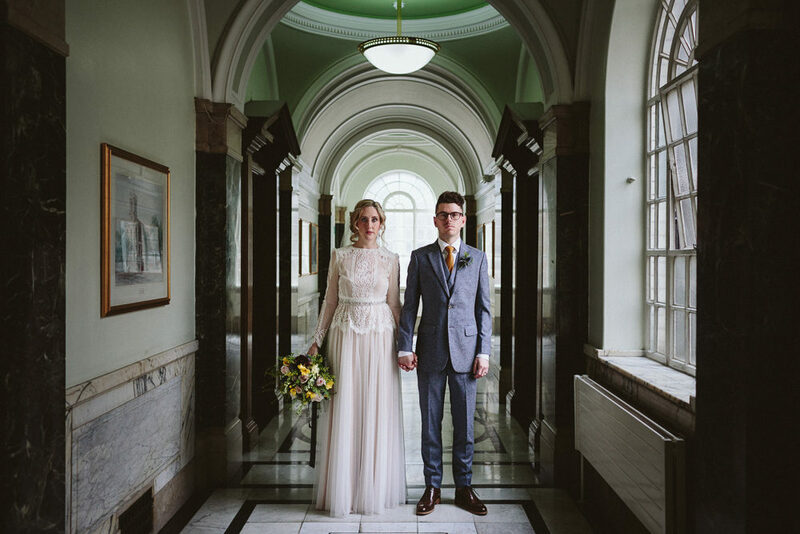 We held our ceremony at Islington Town Hall. 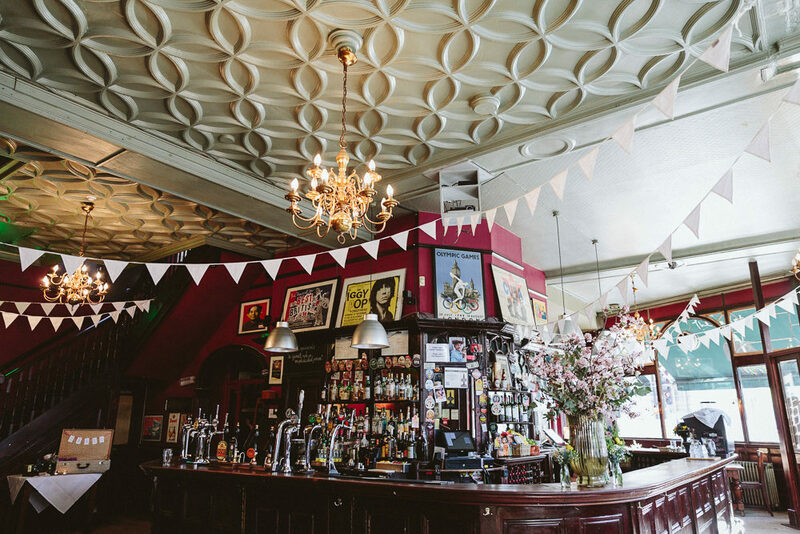 A London venue was essential to us to reflect our life here, and a place where we’ve celebrated birthdays and many happy occasions with friends, in Islington. It just felt right and the Richmond Room has the most stunning art deco ceiling. Cynthia our registar was perfect (and since featured in Married at First Sight!) She was calming and had such a lovely way about her. Pastel pinks, blues and greens to tie in grooms suit, bridesmaids dresses and flowers. We wanted an eclectic colour scheme and for everything to not be too ‘matchy matchy’ – but at the same time these elements still needed to be connected to the overall vintage look and styling. 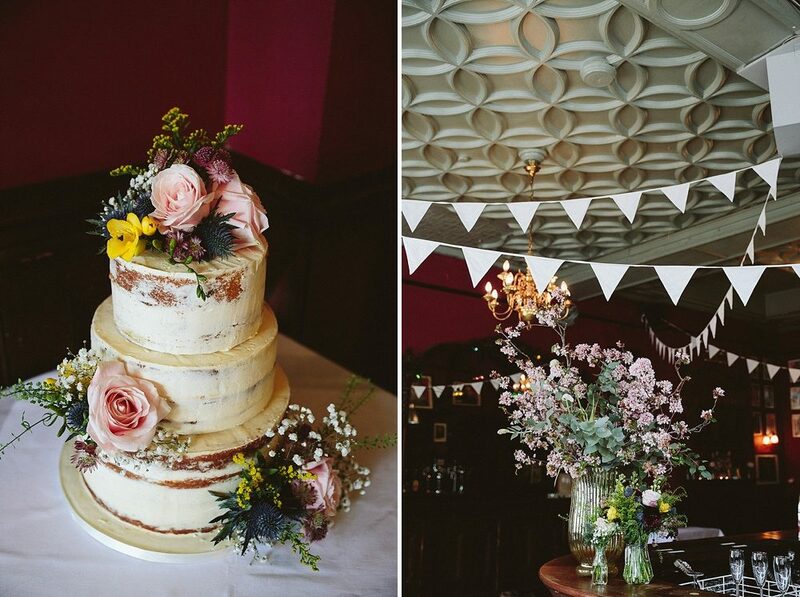 Our wedding stationery included a gold swallow and an art deco feel of white and gold, so these pastel colours worked alongside the golds/yellows on the day. We had these custom designed by Aaron Ulph, his prices were very reasonable and included print and delivery. 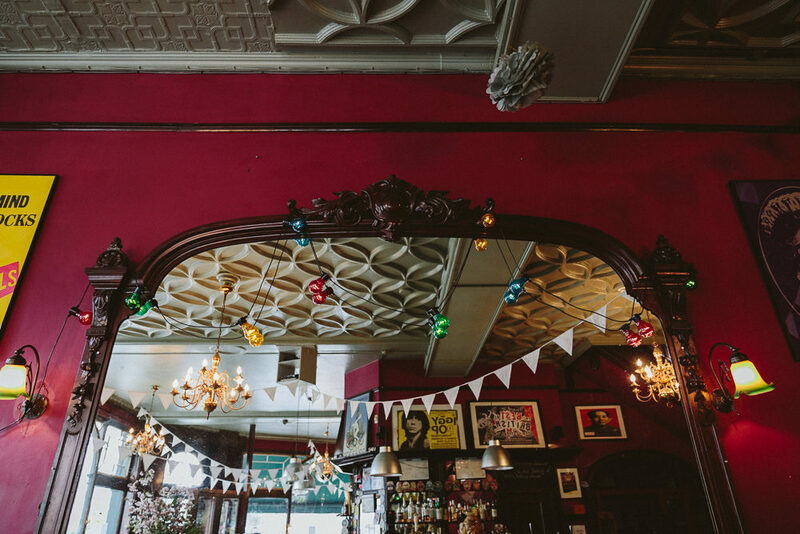 Décor was part of the reason we selected The Peasant as a venue, the gastropub as a starting point has an amazing array of rock and roll/circus themed artwork and interesting features along with tonnes of history and character. We of course wanted to add a few touches ourselves, a Mrs and Mrs gold sign for the fireplace, tea lights, and party signage to add a touch of fun – but it really didn’t need to much dressing, and with so much else to think about, this was such a relief! I really struggled to find a florist within budget that really got my sense of style. 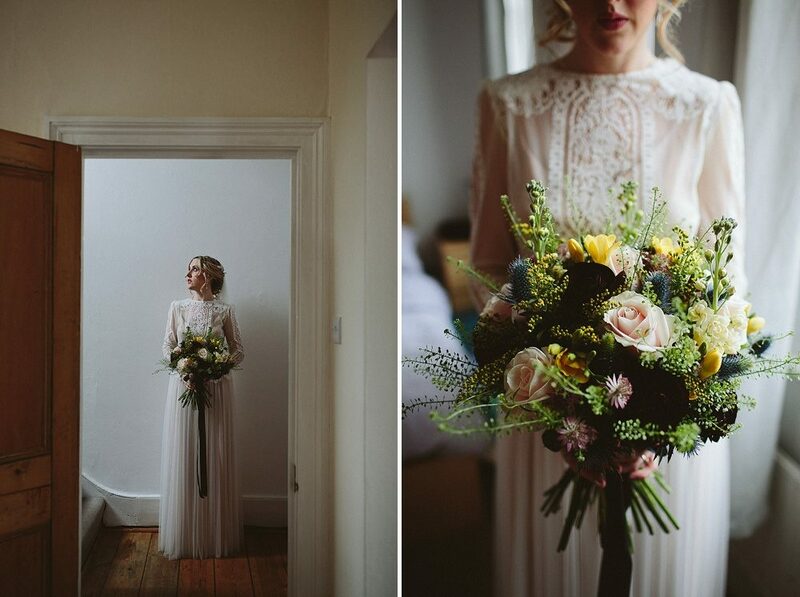 I wanted bohemian, free flowing flowers, meadow style that didn’t break the bank (no tall order then!) After lots of research I ended up finding a local florist in Highams Park, The Village Florist. The team there reviewed my Pinterest boards (poor them!) and spent a really good amount of time with me and mum going through what would be seasonal and work for the structure and overall look we wanted. That’s one piece of advice I have too – don’t get so sucked into Pinterest that you stop making real planning and buying decisions. Janine managed to pick out all the best bits I liked from each of my Pinterest pics and pull together a vision that we were just so happy with (including the all essential dusky blue long ribbon) – on the day when we went to collect the flowers (due to an unforeseen issue the Florists couldn’t deliver so we got them to the venue ourselves) – seeing the car teaming with baby’s breath, thistles and roses we knew we’d made the right decision trusting her to ‘get’ the vision we had in our minds! Grooms party had thistles with solidaster. Centrepieces, same as my bouquet with added baby’s breath. Mixture of vintage glass vases and dotted around milk bottles with flowers in for tables too. The chunkier larger flowers from the bouquets to decorate the cake. My aunty bought me a very special gift in the run up to the wedding, a locket to pin into my bouquet with a photo of my sister in. We lost Eve in 2005 from Sudden Unexplained Death from Epilepsy (SUDEP). It was really hard not having her with me on the day, as that sister role is such a special one in the run up to and during a wedding (despite all the amazing efforts the girls made for me). It was such a thoughtful idea, to be able to have her with me all day and something to keep forever after too. Sam’s sisters did two readings for us – The Bridge Across Forever by Richard Bach and This for you, for both of you, By Neil Gaiman. In the evening we had a friend who also happens to be an awesome DJ, Nick Roberts. He tends to DJ at bars around East London, so we knew he’d get the sound we were after. We wanted to move through the eras with some northern soul, through to 60’s and 70’s, landing in brit pop and indie – not an easy task, especially since Sam and I are so into our music and gigs, but Nick handled it so well, even ‘managing’ requests from guests in a way that suited the tight list that we shared with Nick before the day. Nick set up a Spotify playlist for us to add our must haves to and he weaved through with other ideas, making it so much better! So many people complemented us on the music – he really did make the evening the party we’d imagined during the planning. First dance – Maccabees, Toothpaste Kisses (Nick our DJ also bought us the vinyl version which our bridesmaid and best man had framed for us – such a lovely thought and memento). We knew this would be our choice over 6 years ago when we danced to this song in our kitchen in Kilburn! Cake – Wheat Free Kitchen – we really wanted a naked, 3 tiered style which would allow for wild flowers to cascade down across the tiers. I’d seen the wedding cakes Wheat Free Kitchen have created for other weddings and knew they’d be up to the challenge. Gem was really creative with how we could make the flowers work and talking us through the flavours. I had some crazy ideas to start with but she did a great job of simmering down my vision into what would work in cake terms – we had a blueberry, lemon and vanilla layers, so people could take their pick. All were a huge hit! We had gone through a lot of photographers during our search but no-one grabbed us – photography was THE thing I knew was most important to us, as I’m a keen photographer myself. A friend recommended Kate and Jon. From initial correspondence up to the final day the pair were perfect in every way! At the engagement shoot they really knew how to make us feel comfortable and to get the most out of the setting (God’s Own Junkyard). We didn’t want lots of overly romantic posed photos and they really got that, getting very creative with the way in which they shot us. On the day itself Kate and Jon blended in to the background so well and we just can’t get over the photos which I’m trying not to look at every day! Shots included the ones that other photographers miss (including our god daughter peeking out from over bus window), and quirky angles/backgrounds – 100% spot on. They blew us away with how they captured the day, and continue to be good friends now. They also made us a Super 8 keepsake film – this was a great option for us as we found traditional videography not to our taste – it’s short, it captures the highlights of the day perfectly, has an amazing soundtrack with a vintage feel, exactly what we wanted. Every time I watch it the day comes flooding back – irreplaceable. We got married on our decade of being together anniversary – there was something special about the day being a celebration of our life with our friends so far. 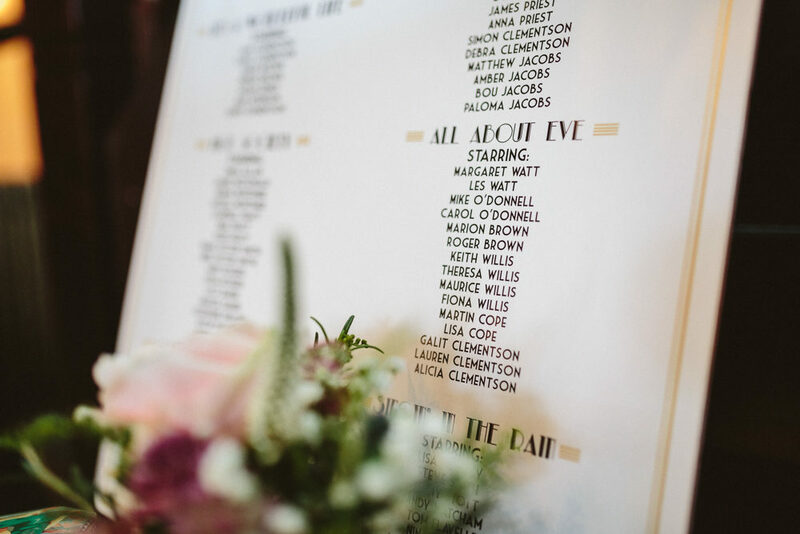 When planning the day we wanted an informal ceremony and a great party at the end – and the day really felt like exactly that. It was so special dancing with Sam and looking around to see everyone we loved in one room, having equally as great a time. All the little details that you worry about just won’t matter on the day – it all comes together and takes on it’s own energy, you’ve done the hard work, just enjoy it now! We found it so hard to break away from all the fun to take time to ourselves to soak it all in. It was great getting away to get some photos done around the area of The Peasant, it was the only time we both took it all in – so make sure you take some time for yourselves in a secret corner somewhere!